The GLT holster was created to provide a carry system for handguns with mounted accessories under the barrel rail or on the trigger guard. 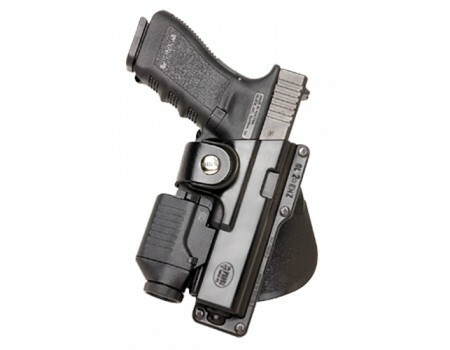 In addition to allowing holstered carry of these handguns, Fobus has addressed safety and retention concerns that are unique to this model holster. The handgun is held securely in place by utilization of a muzzle stud and a safety strap encircling the trigger guard. While assuring positive retention, rapid presentation of the handgun is made easy due to the open withdrawal slot on the rear of the holster and the design of the safety strap.This model is compatible with: Glock G19/23/32, G19/23/32 (accommodates light or laser); Smith & Wesson SD9 VE, SD40 VE; Taurus PT940.